3342 Star Wars #3 is a Classic Star Wars set released in 2000. 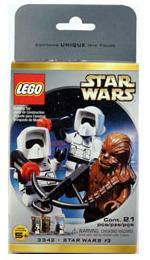 The set includes two Scout Troopers, and one Chewbacca Minifigures. The set also includes cardboard backdrops and a piece for the Minifigures to stand on. This is a description taken from LEGO.com. Please do not modify it. Collect all 4 minifigure collectible sets! Each set includes information cards for each figure and 3 display stands. 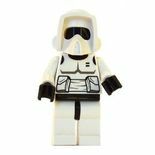 All figures are standard size LEGO figures measuring approximately 1½ inches tall. 5000214 LEGO Star Wars Character Encyclopedia | LEGO Star Wars: Anakin: Space Pilot | LEGO Star Wars: Darth Maul's Mission | Save the Galaxy! Facts about "3342 Star Wars #3"
ShopDescription Collect all 4 minifigure collectible sets! This page was last edited on 1 May 2016, at 22:15.